Today Sarah Martina Parker is taking a stab at stretching outside of her comfort zone. She's chosen to tackle coloring. If you are a fan of Sarah's (who's not? ), then you'll notice that she doesn't do a lot of lined images. But, she's done a fantastic job here, with Easter Blessings. The key here was that she tried something that she isn't all that comfortable with, but kept true to the rest of her style - kind of a modern shabby-chic. Soft colors, some stitching and fiber accents. I just love the way she's "messily" colored her image with pastels. It adds to the soft shabby-chic look and stays true to the whimsical nature of the style. 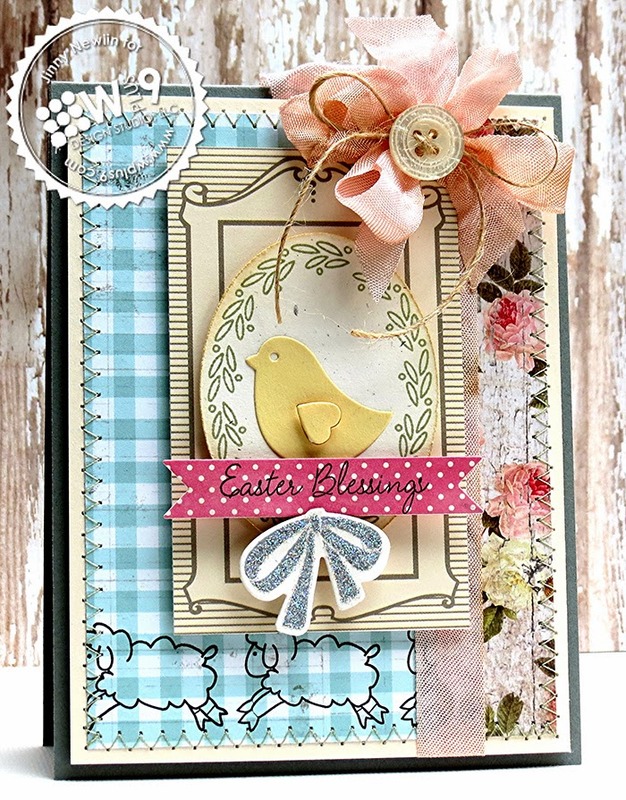 Lea Lawson has a very fitting Easter card to share with us today. She has absolutely captured the ethereal essence of Easter. 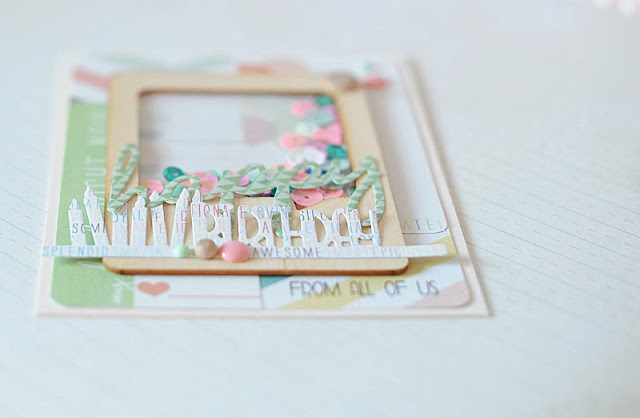 Be sure to stop by Lea's blog for all of the details on creating this card! Welcome to week 4 of Wplus9's 4th Birthday Celebration! Are you ready for another challenge and a chance to win a $100 Wplus9 Gift Certificate prize? I hope you all have been having fun with the challenges this month. I sure have enjoyed seeing all of your entries! This week we are going to Stretch It, stretch those creative muscles that is! I'm challenging you to step outside of your comfort zone. Try a style that is not your norm, attempt an advanced technique that's intimidated you, use supplies in a creative way...anything that is considered a stretch for you. Me? Well, I'm not usually into time intensive techniques or styles. So, I've challenged myself by choosing a technique that requires a little patience and pre-planning, but the payoff is huge! Inlaid die cutting. Are you ready to play along? 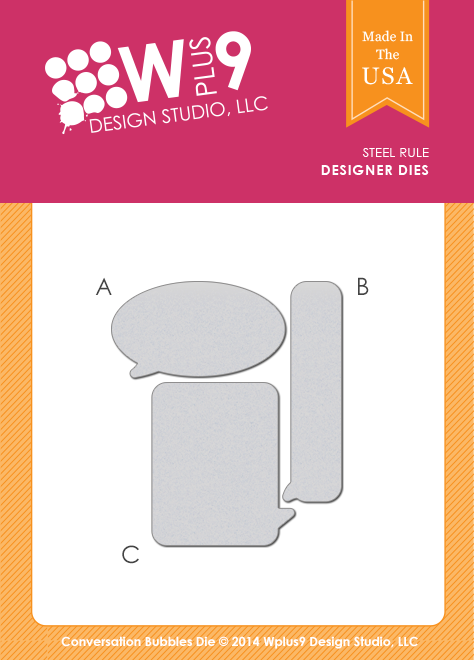 Create a card, tag or layout that stretches your creativity or takes you outside of your comfort zone. Use at least one Wplus9 product and upload your project to your blog or online photo gallery such as Flickr. Then link it up using the InLinkz widget below by 11:59 PM EST, Sunday, March 2, 2014. Winner will be posted by 12:00 PM EST on Monday, March 3, 2014. We will select (1) random participant to receive a $100 Gift Certificate to www.wplus9.com. Winner will be announced Monday, March 3, 2014. Follow us on Facebook and leave a comment on this post for an extra entry. Follow us on Twitter and leave a comment on this post for an extra entry. Tweet or post on Facebook about our birthday celebration and this challenge to help spread the word (be sure to use @wplus9) and leave a comment on this post for an extra entry. 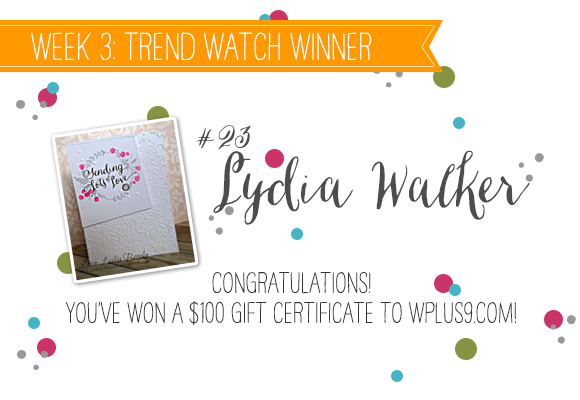 Congratulations to our random winner, Lydia Walker! 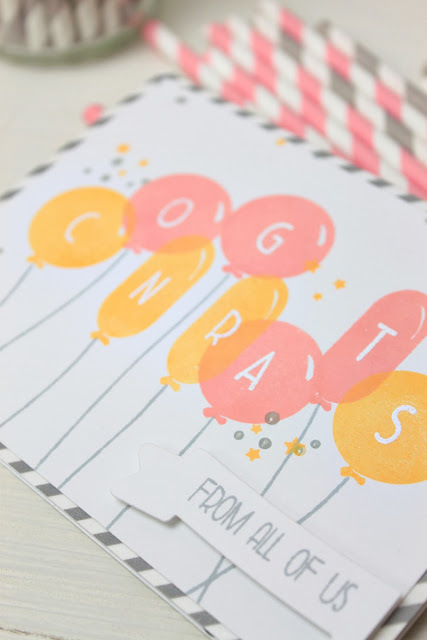 Please email customerservice@wplus9.com, subject line: "Birthday Celebration Week 3 Winner" to claim your prize. I am so happy that everyone seemed to enjoy the Trend Watch Challenge! Be sure to check out the full group of entries here. There is a ton of trend inspiration to be found! If you didn't win this time, don't worry, you'll have 1 more chances to pick up a $100 Gift Certificate. The next challenge will be posted shortly. We are going to Stretch It! Yep, let's stretch those creative muscles and tackle something outside of your comfort zone, or try out some of those more advanced techniques. This one is all about exploring and trying something new. I myself, am guilty of being a "results driven" crafter. And if something looks too messy, too difficult, or too time consuming...I'm out. LOL But, I am learning to let go and just enjoy the process - the triumphs and the failures. So don't be afraid. Let's really challenge ourselves, you just might like it! Check back a little later today for the official challenge post and Mr. Linky! Don't forget, there are multiple challenges to join in this month. In addition to the weekly $100 Gift Certificate challenges, we're posting challenges in between. Click here to play along with Watercolor Made Easy Challenge. Click here to play along with the Spotlight Challenge. Jinny Newlin is back with us today with 2 cards to share. 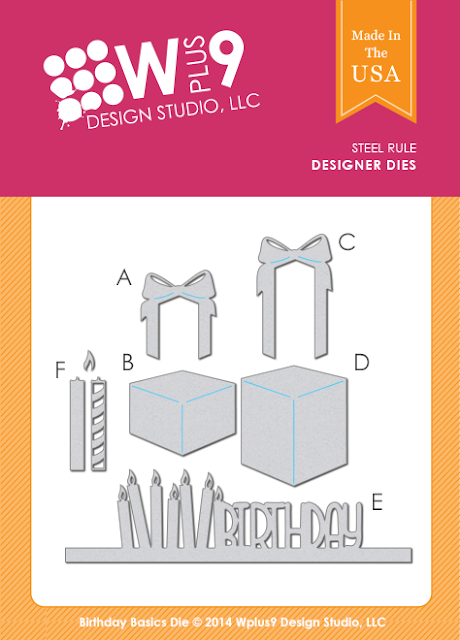 Her first card is a fun one featuring the Birthday Basics Die and the Whole Lotta' Happy stamps and dies. I feel so very lucky to have Jinny creating and posting for us so soon after delivering her newest little bundle of joy. And apparently her mojo isn't being affected at all by a lack of sleep. 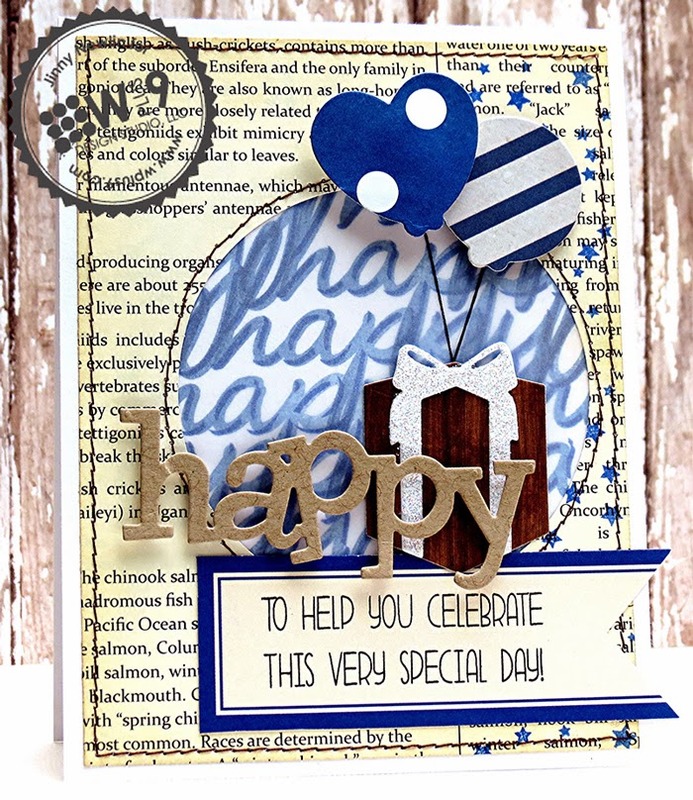 This birthday card is packed with fun, from the background stamping to the woodgrain package, this card is delightful! I also think the color scheme that she's chosen makes this a great masculine card. 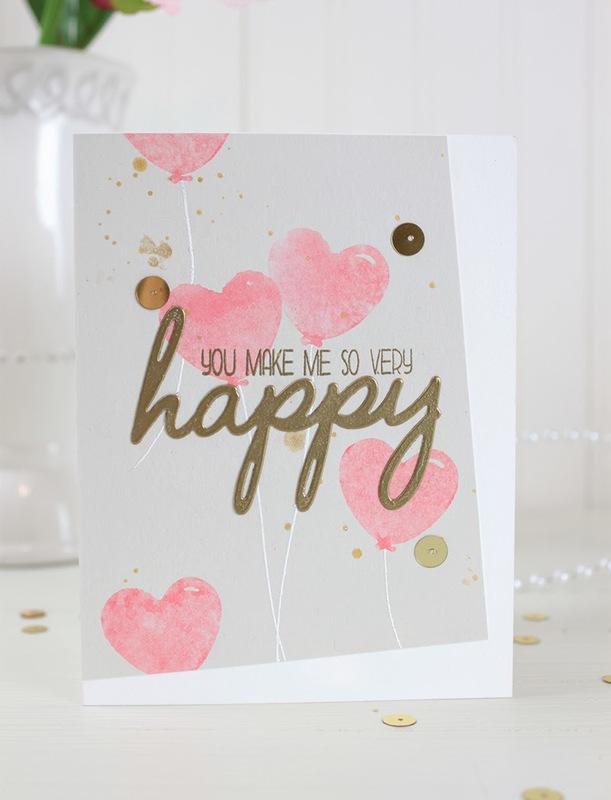 Be sure to stop by Jinny's blog for full details on this card. 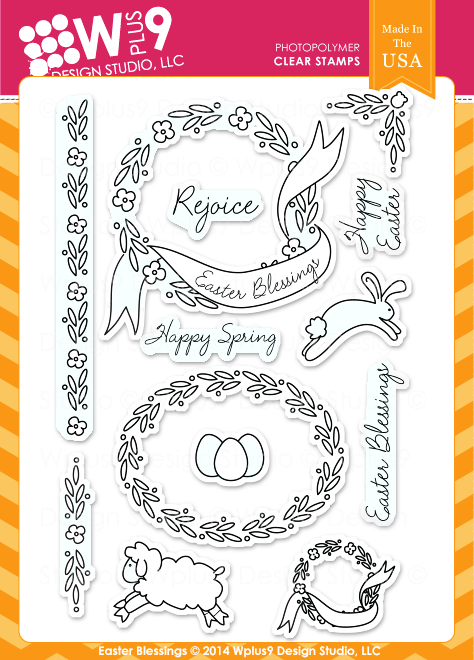 Let's switch gears and take a look at a beautiful Easter card she has to share with us featuring Easter Blessings. 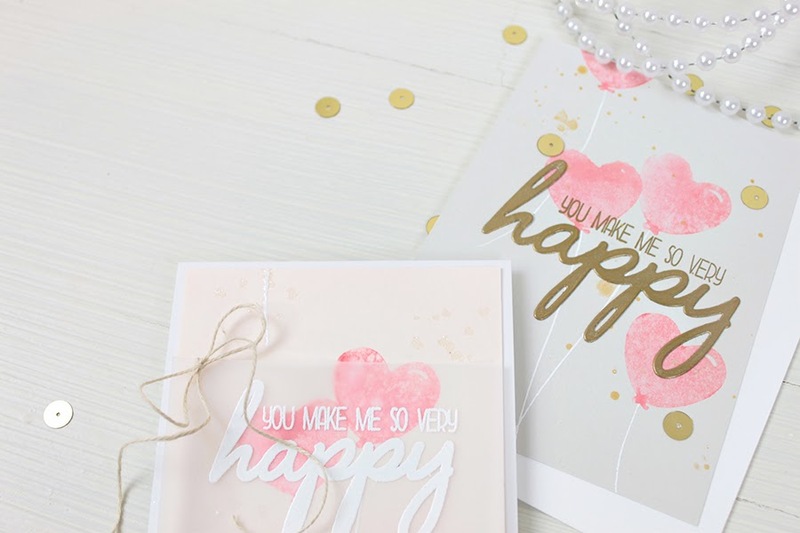 Jinny's combined several sets to create this soft, yet vibrant feminine card. 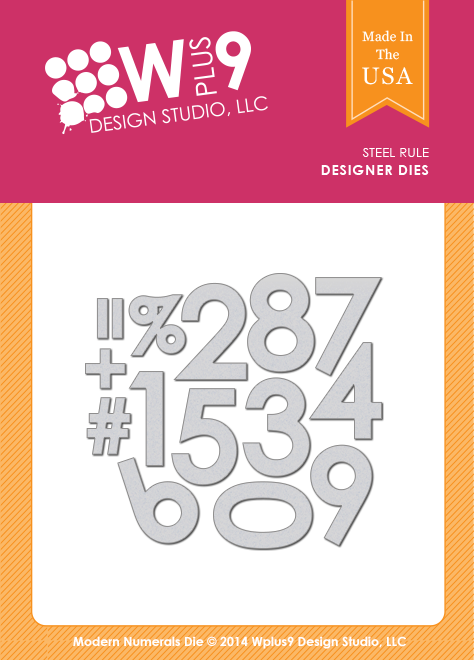 This is a great example of you can combine several sets and dies together. 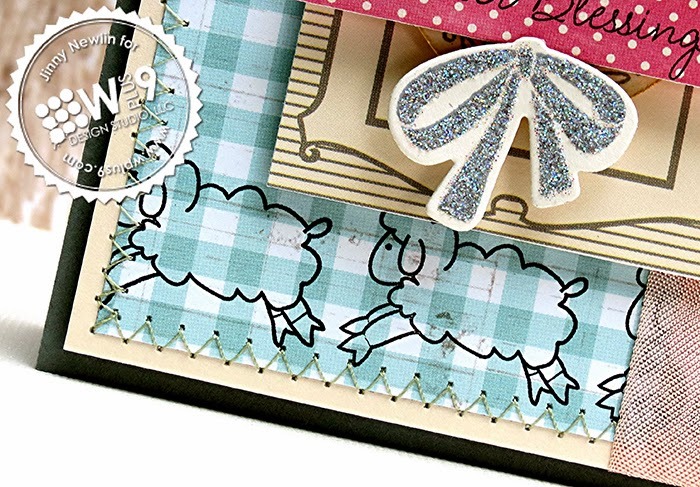 And the little lamb border at the bottom just kills me, SO cute! You can find all of the details on this card on Jinny's blog. Hannah Craner is back to share her take on current trends. And she's chosen one of my personal favorites - combining modern patterns with vintage floral prints. If you've visited the blog for any amount of time, then you know that I am a huge fan of mixing patterns and styles. Love the unexpected and eclectic vibe. 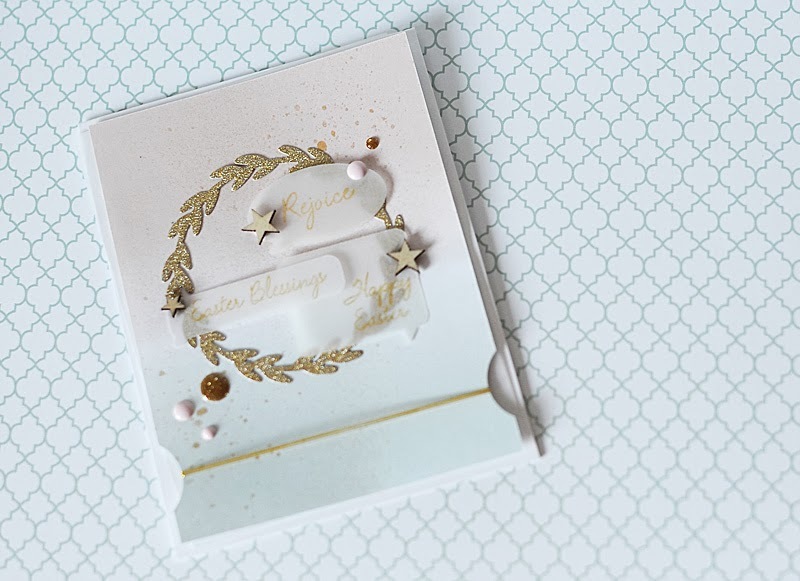 Here, she's combined the new Just Geometrics: Triangles stamp set with a large floral patterned paper. I think her choice of striped paper helps bridge the gap between the two genres perfectly. She keeps it light by adding a little whimsy with the broken sentiment and by placing the Birthday Basics die on a diagonal. 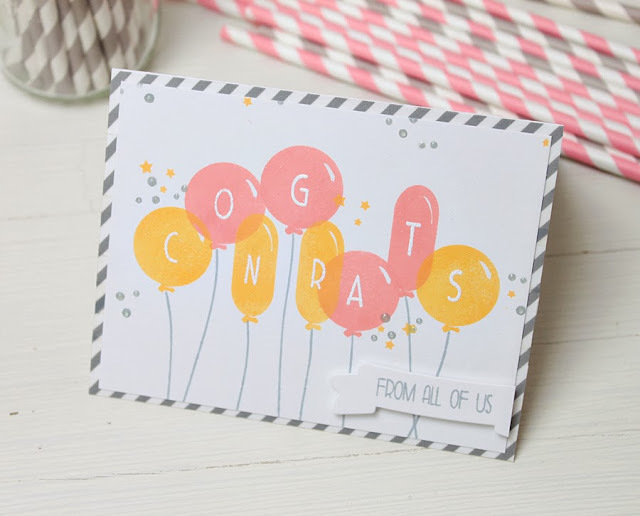 Hannah has all of the details on creating this card over on her blog. Be sure to stop by and check it out! It's Sarah Martina Parker's turn to get trendy with it. Na-na-na-na-na-na. Sorry...couldn't resist. I'll stop now. I think she has managed to pack almost every current trend into this beauty. And successfully! I was a little surprised when I received this one, in a good way, no doubt. It just seems so outside of Sarah's norm. But if you break it down, it's definitely got Sarah's signature all over it. Gorgeous combination of softer colors with perfectly executed layering of elements. Notice how she has cleverly used Just Geometrics: Triangles not only as a background pattern, but to lead the recipient to the rest of the sentiment - "times ahead". I also can't help but mention how much I love the gold embossed confetti from Borders & Backgrounds 3. 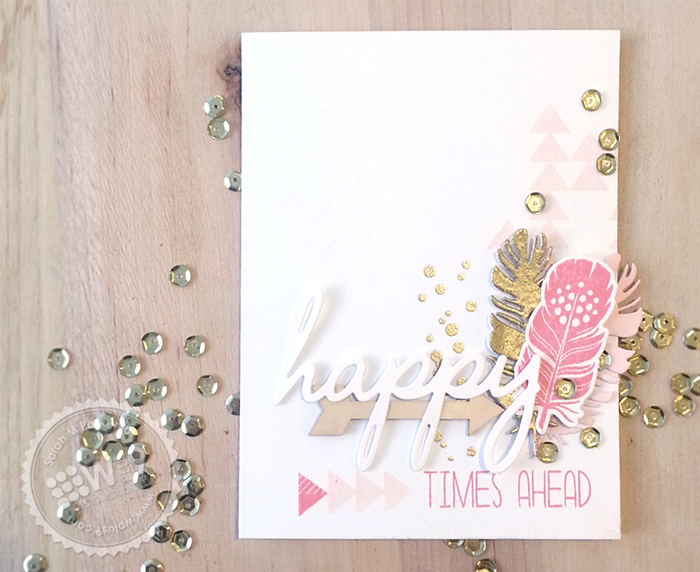 Pair that with our Fanciful Feathers stamps and dies and the Happy Trio Die and it's a recipe for success. For our resident "shabby chic-er", I think Sarah's got this contemporary collage thing down too. How about you? Sprinkle on some sequins and call it a day! Speaking of, we do have a special discount for you from Pretty Pink Posh on all sequins! A great big THANK YOU to Paulina for being so generous! Hello, hello! 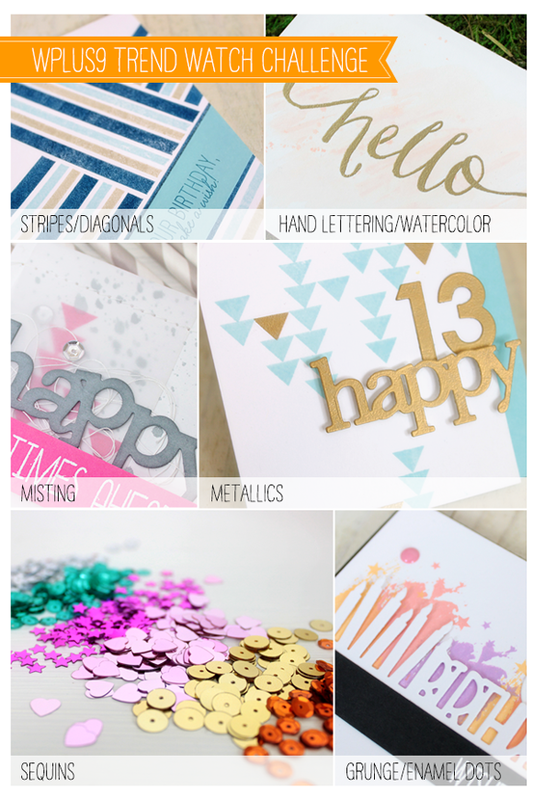 Today Lea Lawson and I are teaming up to share a little more inspiration featuring the Birthday Basics Die. Our styles are so different that I thought it would be a great way to showcase the versatility. Lea took the soft layered route, incorporating a ton of feminine pastels and plenty of sequins. Speaking of sequins - which are popping up everywhere - we have the scoop on THE BEST sequins around. And, we have an exclusive discount just for Wplus9 fans! Pretty Pink Posh has the most gorgeous colors in stock. And did you know that several colors give you the option of flat or cupped sequins? Awesome! Paulina has been generous enough to offer a 10% discount off of all sequins just for us - to share with all of you. Just enter the code WPLUS9PARTY at checkout. Since we are focusing on trends this week, I decided to go a little more bold and work in the "artsy/grunge" look that is making a resurgence into main stream. I thought enamel dots were a perfect compliment to this look. We've had so many requests for the So 80's stamp set since we retired it, that we've decided to bring it back for a special limited run. Stay tuned in March 2014 for it's return. 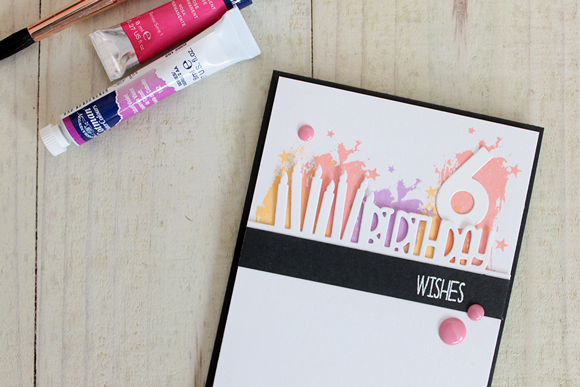 The splatters and paint strokes in this set were perfect for layering behind the "birthday" die cut. The bright streaks of color (thanks to our upcoming PUREColor Dye Inks) push the white forward and make it pop. 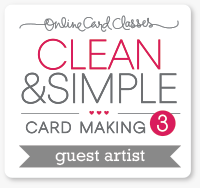 Be sure to stop by Lea's blog for full details on her card. Thanks for stopping by. I hope your week is off to a great start! Welcome to week 3 of the Wplus9 4th Birthday Celebration! Are you ready for another challenge and a chance to win a $100 Wplus9 Gift Certificate prize? This week we are focusing on trends! Some trends come and go so quickly that I don't even get a chance to jump on the bandwagon. And some stay so long that I think I might scratch my eyes out if I see them again. Luckily, some are so much fun, that they become classics or staples that you can work into your everyday style. Either way, all trends are cyclic, so chances are, you'll be able to pull out those supplies again in a couple of years. These are just a few trends that I've noticed emerging in design at the moment. This is not a complete list by any means, so if you've got another one in mind that you've noticed...go for it! Are you ready to play along? 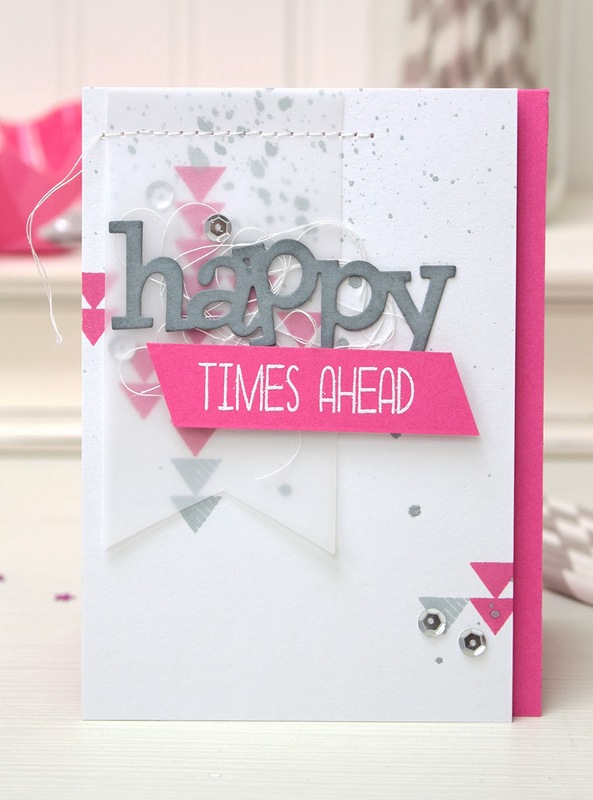 Create a card, tag or layout with a focus on a current trend. Use at least one Wplus9 product and upload your project to your blog or online photo gallery such as Flickr. Then link it up using the InLinkz widget below by 11:59 PM EST, Sunday, February 23, 2014. Winner will be posted by 12:00 PM EST on Monday, February 24, 2014. We will select (1) random participant to receive a $100 Gift Certificate to www.wplus9.com. Winner will be announced Monday, February 24, 2014. 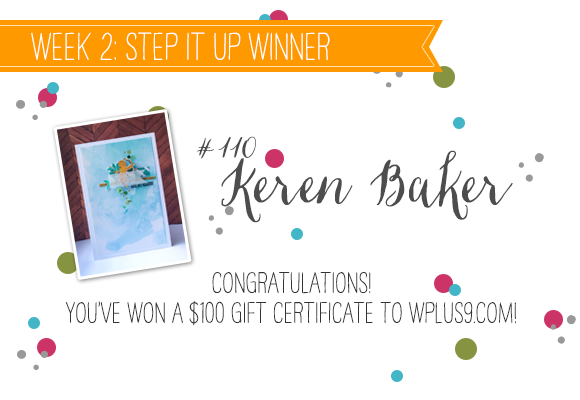 Congratulations to our random winner, Keren Baker! 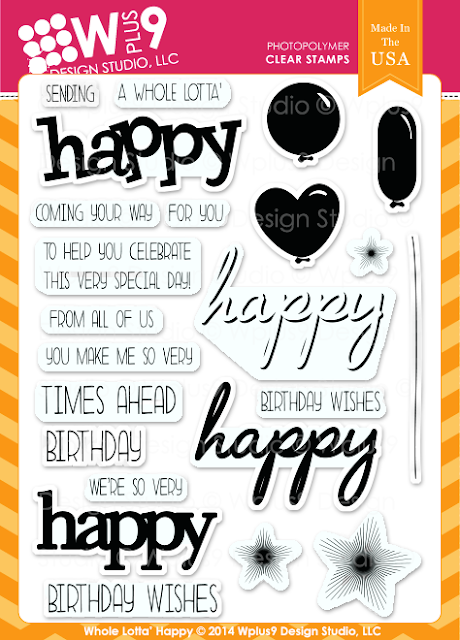 Please email customerservice@wplus9.com, subject line: "Birthday Celebration Week 2 Winner" to claim your prize. Everyone had some really amazing entries. If you haven't checked them out, you should, there is some really great inspiration to be found! You can view the full group here. If you didn't win this time, don't worry, you'll have 2 more chances to pick up a $100 Gift Certificate. The next challenge will be posted shortly and it's all about the trends! We are on a Trend Watch. Some trends are in today and out tomorrow, and some become classics. Either way, they're cyclic, so it's always fun to try them out. Check back a little later today for the official challenge post and Mr. Linky! Today we have a special treat from Jinny Newlin. I always look forward to seeing Jinny's work. It's like she some how manages to pack a little bit of herself into each design. It sounds corny, I know. But it's like that favorite pair of jeans, there's always something so comforting and genuine in her creations. 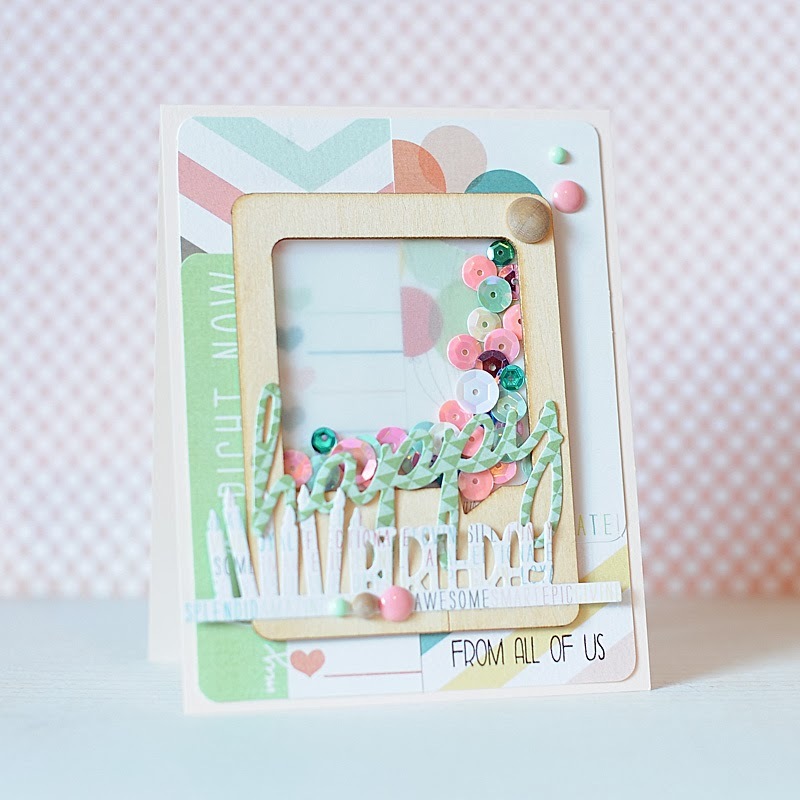 For this card she's combined several of our newest release items. 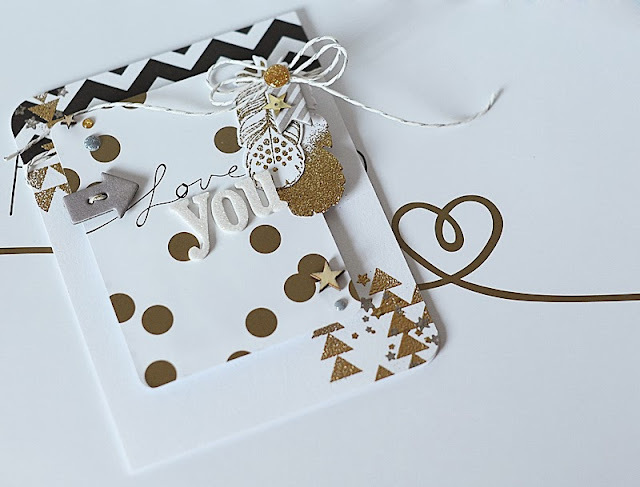 I love the little shaker envelope that she's created using the Vintage Envelope Die. She filled it with several sequins and stamped die cuts using the Whole Lotta' Happy stamp set and companion die. The Conversation Bubbles Die was a great way to add the sentiment and still allow the contents of the envelope to shine through. 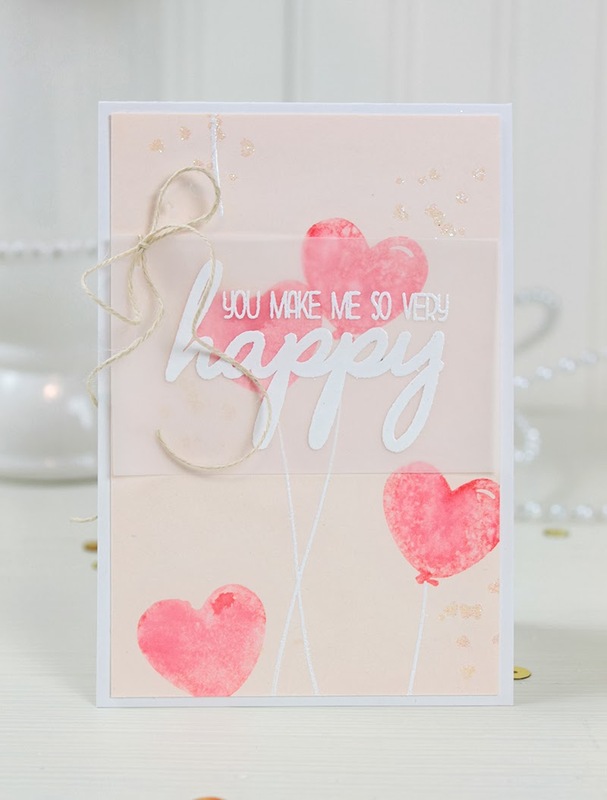 Be sure to stop by Jinny's blog for full details on this card, and while you are there, don't forget to leave her some love! 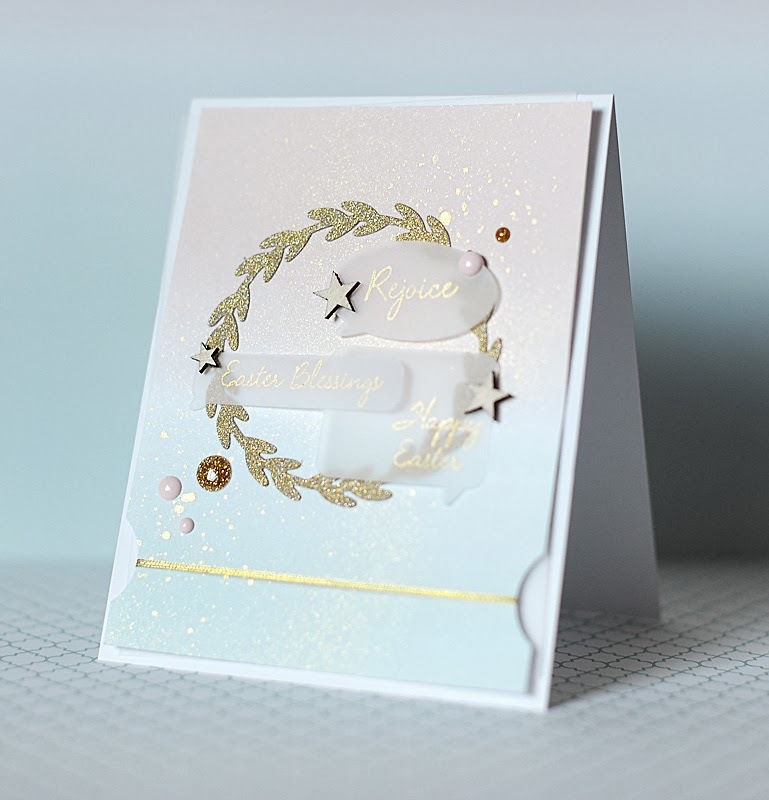 Lea Lawson is sharing a gorgeous card with us today featuring something new, something old, and something gold. I asked Lea to showcase something using her favorites from both past & present...and WOW! what a showcase. I have to say, I am blown away, absolutely blown away by the combination of Just Geometrics: Triangles and Borders & Backgrounds 3 layered together. 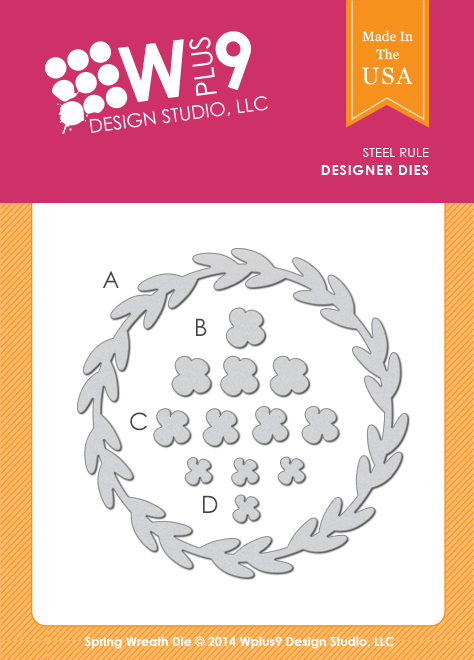 Emboss them in silver AND gold? Well, who said you can't mix your metals? I never believed that old "rule" anyway, and here is the perfect testament! Fanciful Feathers is the icing on the cake. These graphic feathers look amazing paired with the other graphic elements and the addition of that bold black to ground everything was incredibly smart. Wonderful design Lea! Step It Up Challenge Extended! Several of you notified me that the Link Up Tool for our Step It Up Challenge closed early. Thank you so much for bringing it to my attention. It seems our time zone was off for some reason. We apologize for our oversight. So, we are extending the deadline through the weekend! You will now have until Sunday, February 16, at 11:59 PM EST to link up your entries. The lucky winner will be posted by noon on Monday. In the meantime, scroll down to check out our newest card and video, or click here. 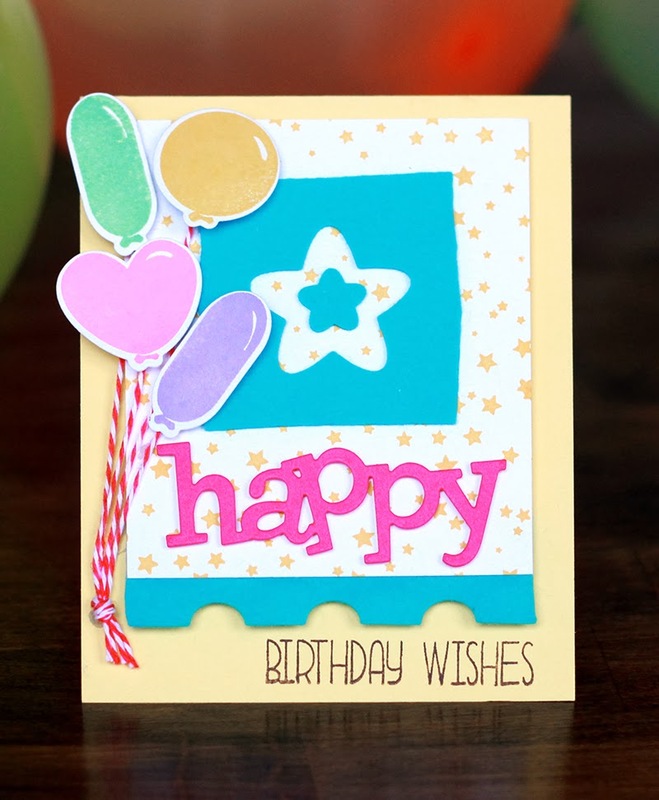 Today's video features a quick and easy card that's easily adaptable to all occasions. 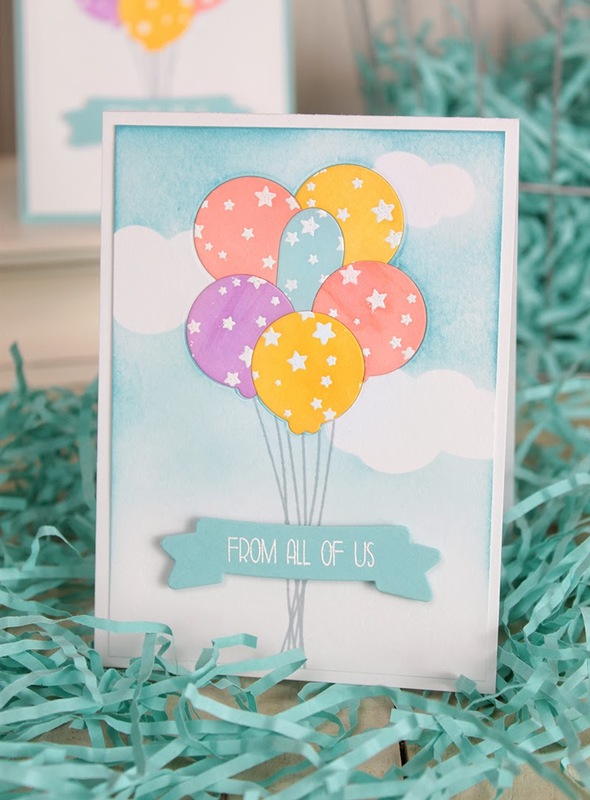 I've used our Everyday Alpha stamp set to create this fun balloon message card. 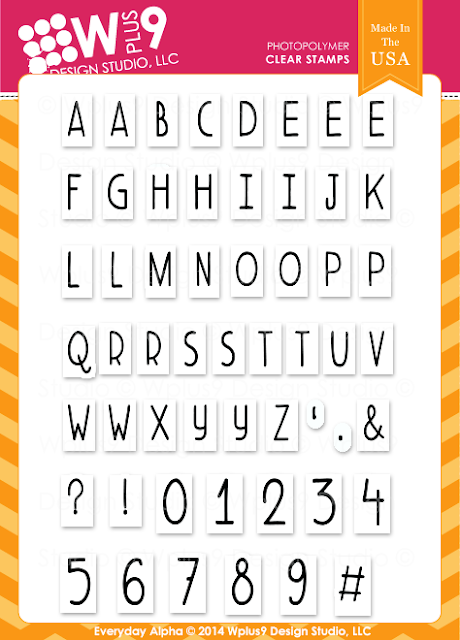 The scale of this alphabet is perfect for so many applications, including cards, scrapbook pages and those Project Life albums. Just switch out the colors and/or message and this is a great design for all ages. I'm telling you, I just can't get enough of those balloons! Hope you enjoyed today's card. Thanks for stopping by and have a wonderful Valentine's Day! Hannah Craner is joining us today, and man is she bringing the party! 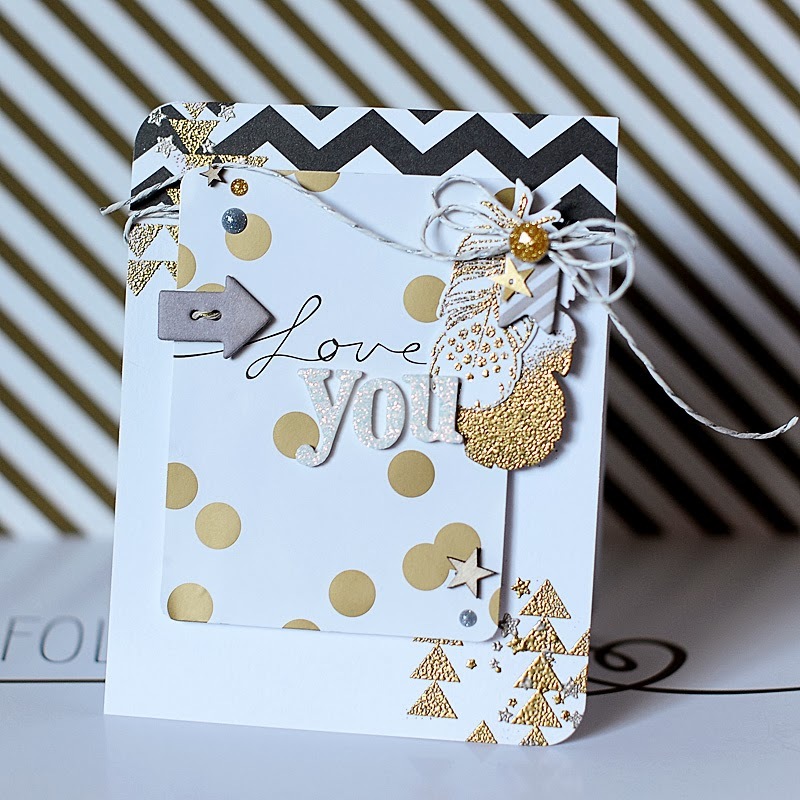 Check out this fun and festive card she's whipped up. This is the epitome of a perfect child's birthday card if you ask me. 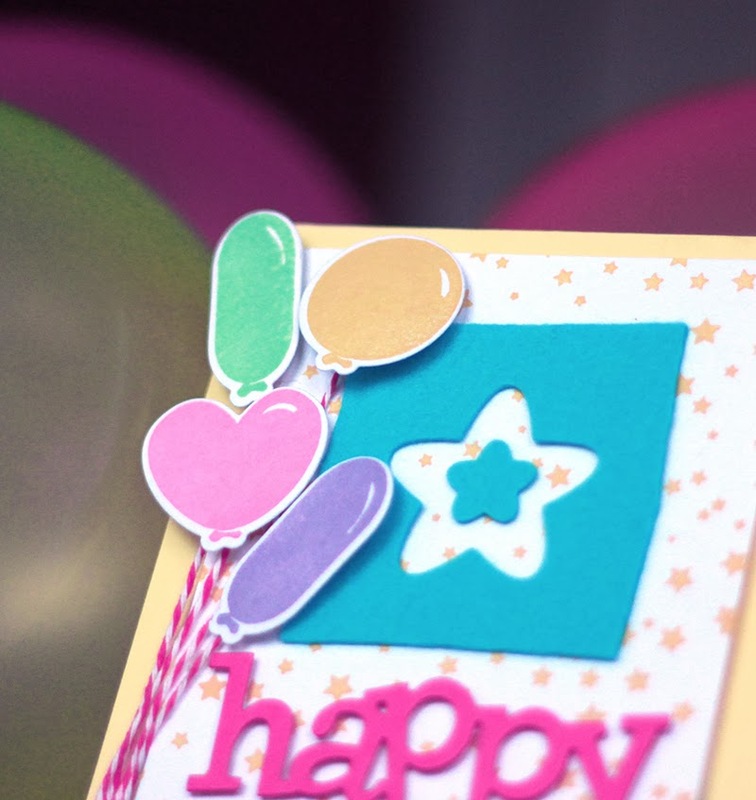 It's got confetti, balloons, stars, and with those bold bright colors, you can't help but smile. And thanks to the Whole Lotta' Happy Companion Die and the Happy Trio Die, she was able to add plenty of dimension. 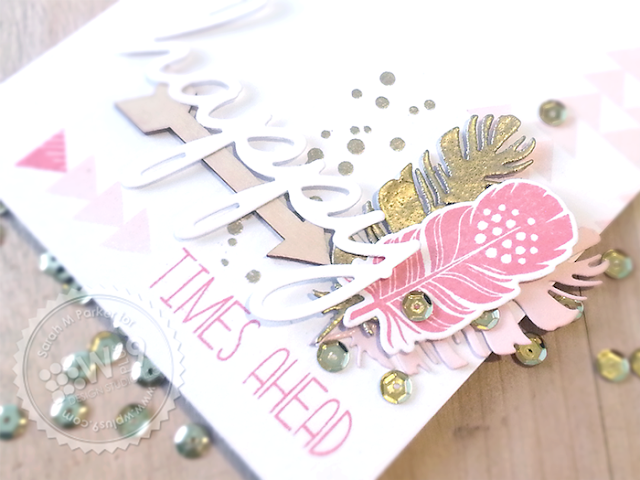 Hannah has all of the details on creating this card over on her blog. Be sure to stop by to check it out! We are focusing on adding dimension this week and who better to give us a helping hand than Sarah Martina Parker? She is a queen when it comes to layering and she is reigning supreme with this beauty! Just look at all of that dimension! She's used several techniques in this card. Texture? Check. She's used both fabric and glitter. Height? Check. 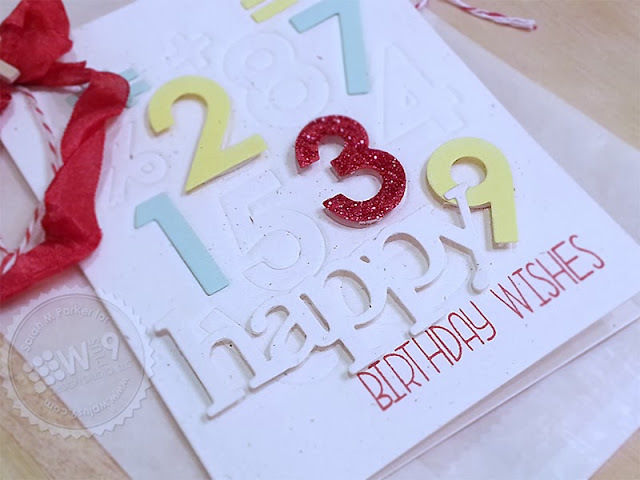 She's gone both ways here by using the Modern Numerals Die to create a letterpress effect and by popping elements up on foam tape. Color? Check. She's chosen to let several elements fade into the background by leaving them tone-on-tone, while spotlighting others with color. I've chosen to highlight her spotlight technique. 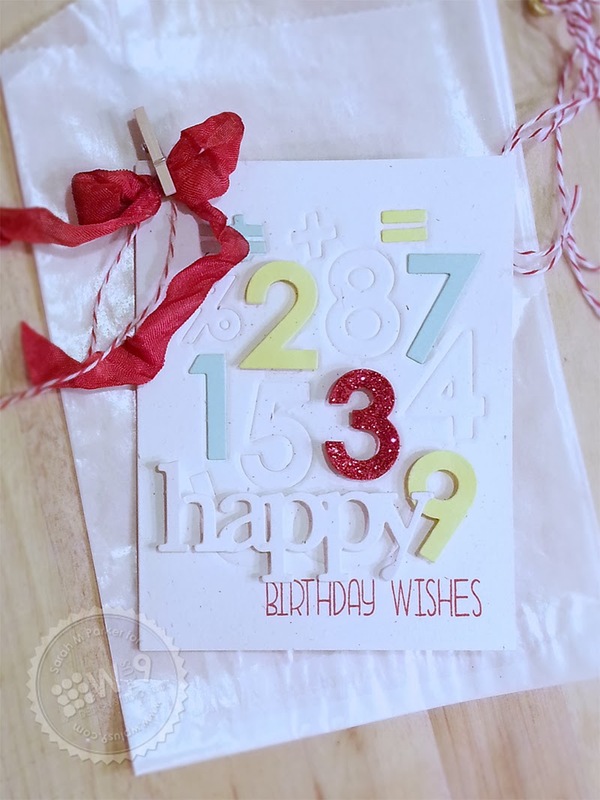 I love her clever use of the Modern Numerals Die, specifically how she used color to add dimension and then took it a step further by using glitter to spotlight the number "3". 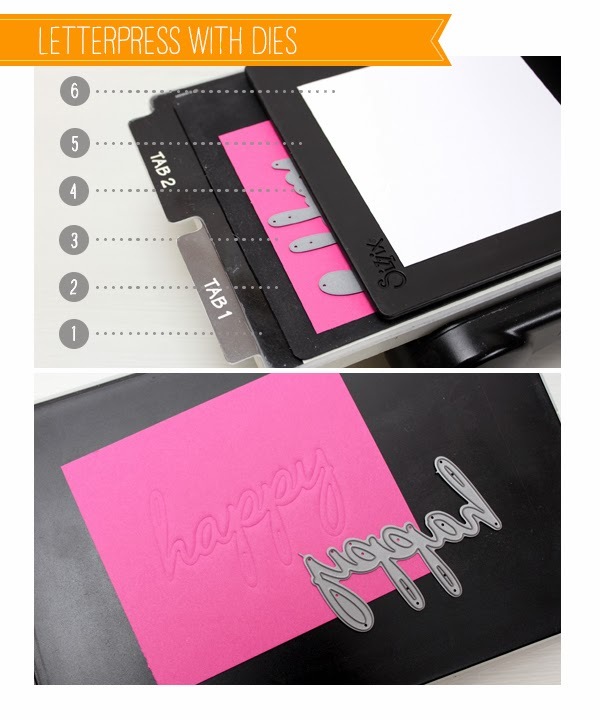 Using your dies to letterpress is a great way to really stretch your supplies. And if you haven't seen it yet, here's the sandwich construction I use for the Sizzix Big Shot. So what do you think? Want to give it a try, I'd love to see what you come up with. If you don't have a die cutting machine, you can still achieve the spotlight effect by stamping multiple images in one color and spotlighting another by stamping it a different color. 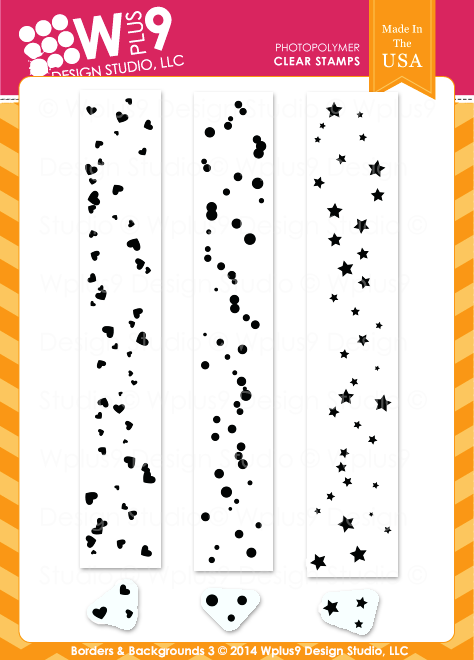 Or you could stamp lined images and then choose one to spotlight by coloring it in. There are several options! If you want to play along, add your link below using the Inlinkz button. We'll keep the link open throughout the month. Welcome to week 2 of the Wplus9 4th Birthday Celebration! Are you ready for another challenge and a chance to win a $100 Wplus9 Gift Certificate prize? This week we are focusing on adding dimension. There are so many ways to add dimension to your projects. 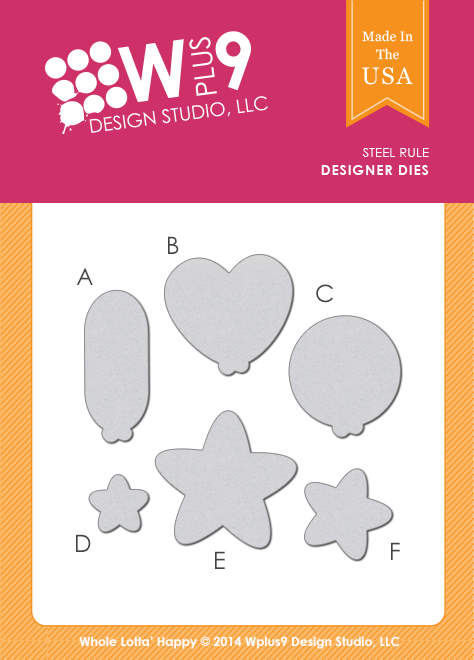 You can add die cuts, texture with embossing paste or fabrics, dry or heat embossing, multiple layers, the list goes on. You can even add the illusion of dimension with color by adding drop shadows. I've decided to share a little collage style project to help kick things off. 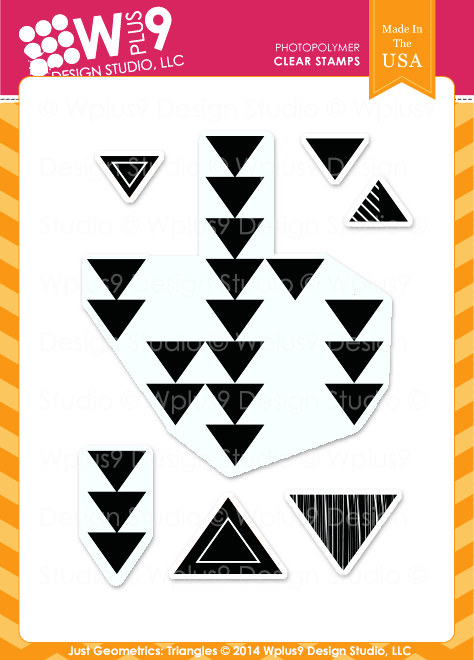 Create a card, tag or layout with a focus on adding dimension. Use at least one Wplus9 product and upload your project to your blog or online photo gallery such as Flickr. Then link it up using the InLinkz widget below by 12:00 PM EST, Friday, February 14, 2014. Winner will be posted by 5:00 PM EST on Friday, February 14, 2014. We will select (1) random participant to receive a $100 Gift Certificate to www.wplus9.com. Winner will be announced Friday, February 14, 2014. Congratulations Robin! Please email customerservice@wplus9.com, subject line: "Birthday Celebration Week 1 Winner" to claim your prize. I am so excited to see all of the participation so far. I am loving seeing all of your creations and learning what everyone's comfort zone is. I am making my way through the entries, and man there are so MANY wonderful projects! If you didn't win this time, don't worry, you'll have 3 more chances to pick up a $100 Gift Certificate. The next challenge will be posted this Monday and it's a fun one. Now, I know Monday-Friday can be quite busy for many of us...so how about I go ahead and give you a head start? For next week's challenge we want to see you Step It Up. Yep, adding dimension! 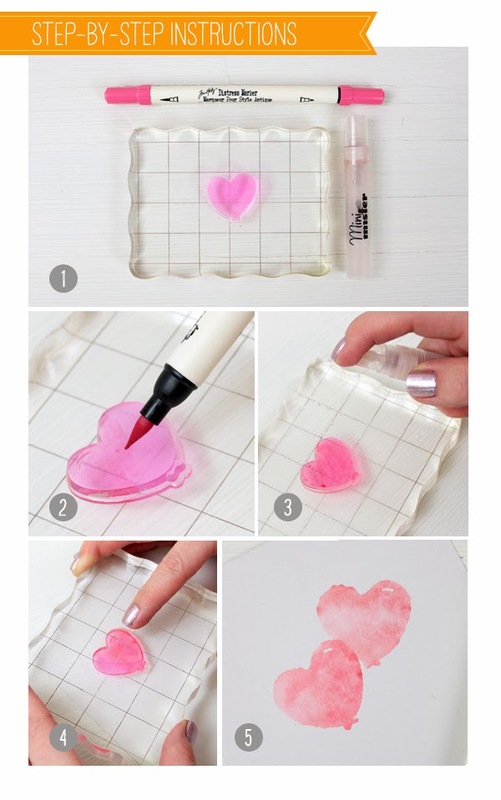 There are so many ways to do this - embossing, texture, layers, twine, die cuts...the list goes on. Be as creative as you like. So, you'll have this weekend to mull it over, or get it done, but Mr. Linky won't officially open until Monday! Don't forget, you still have this weekend to join in the current Monday Mood Board. 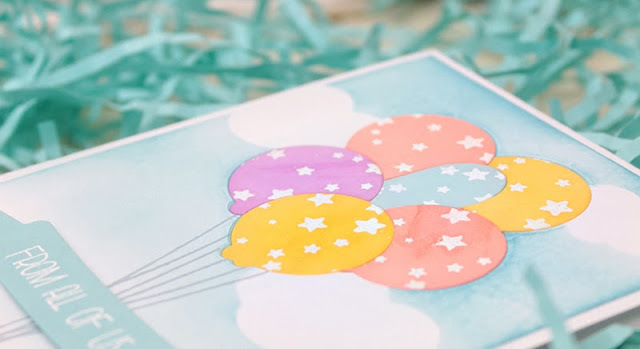 And, if you are looking for a fun technique to try, check out the Watercolor Made Easy post. There's a linky to share your creations! Click here to play along with Watercolor Made Easy. I'm so excited to share more of our new release with you. I am absolutely loving Whole Lotta' Happy, I mean even more than I had anticipated. At first glance it looks like a set for children's cards. But today, I thought I'd show you how it can definitely be used in a more sophisticated design. I've combined a "watercolor" technique along with our new Dove Grey card stock, lot's of gold, and the Happy Trio die for a card that's anything but juvenile. I am really enjoying incorporating watercolor into my cards more these days. Here's the breakdown for re-creating this easy look. Once the balloons were dry, I added a few "splats" of Heidi Swapp Color Shine in Gold. 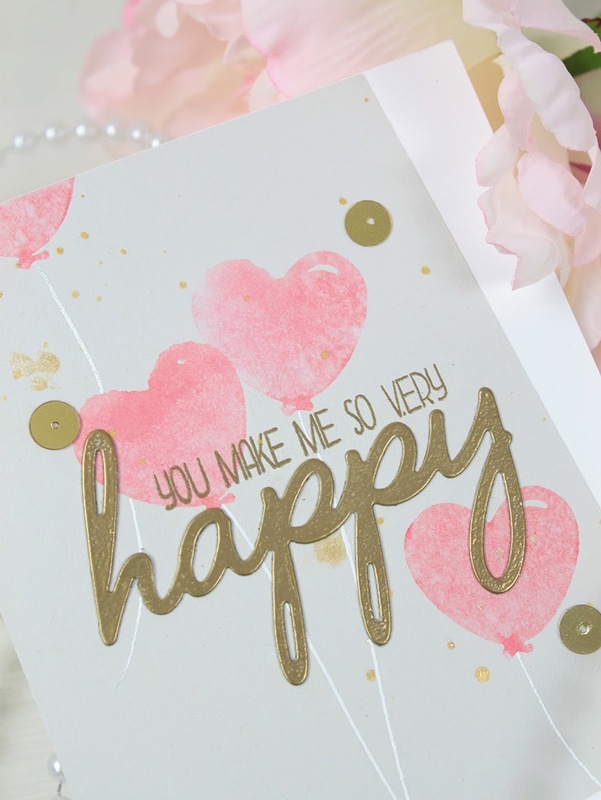 For the sentiment, I embossed the "you make me..." portion directly on the card front in gold. 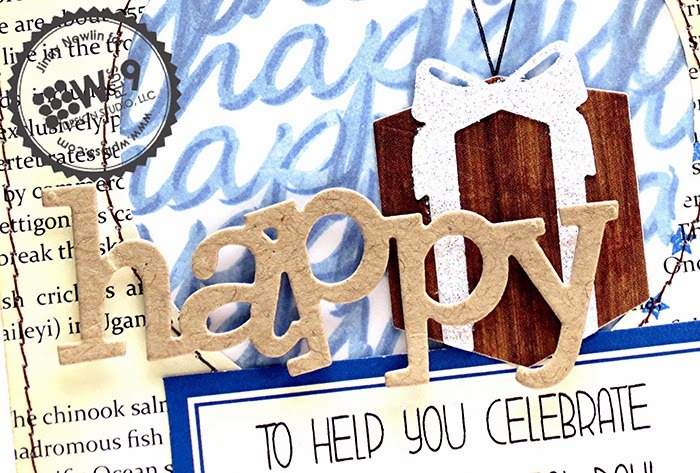 I completed the sentiment by die cutting the word "happy" from card stock and embossing it with gold as well. The Happy Trio Die is such a great compliment to this set. 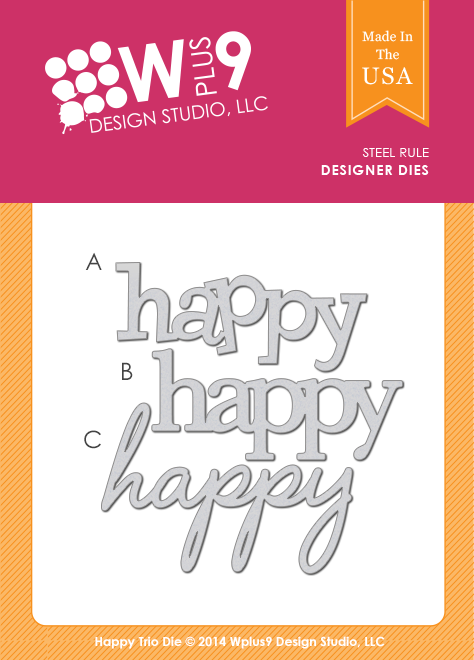 It uses the same large "happy" words, but in a slightly larger scale. This allows you to mix and match them together for even more possibilities. So what do you think? Want to give it a try, I'd love to see what you come up with. If you want to play along, add your link below using the Inlinkz button. We'll keep the link open throughout the month. We have a lot of fun new stuff hitting the store tomorrow, and you can see it here first! All products will be available for purchase at midnight, on February 5th at www.wplus9.com as well as at many of your favorite retailers. Wplus9.com will be down from approximately 11:00 PM EST tonight until 12:00 AM EST while we upload the new products and prepare for the release. The website will be back online and all products will be available for purchase by 12:01 AM EST February 5, 2014. Approx. Measurements: (A) - 1/2 x 5/8", (B) - 1 3/16 x 1 1/4", (C) - 1 1/8 x 1 3/16", (D) - 5/8 x 5/8", (E) - 1 3/8 x 1 3/8", (F) - 7/8 x 7/8"
Approx. Measurements: (A) - 3 x 1 3/8", (B) - 3 x 1 3/8", (C) - 3 x 2"
(A) - 1 1/8 x 1", (B) - 1 1/8 x 1 3/8", (C) - 1 1/2 x 1", (D) - 1 1/2 x 1 3/8", (E) - 4 3/8 x 1 1/4"
Approx. Measurements: (A) - 1 5/8 x 1", (B) - 2 1/8 x 1/2", (C) - 1 3/8 x 1 5/8"
Approx. Measurements: (A) - 2 7/8", (B) - 3/8", (C) - 5/16", (D) - 1/4"
As we grow, we continue to evaluate what we want to be and what we want to provide. We have decided to narrow our focus to providing a nice range of neutral card stock selections and a broader range of color in inks. 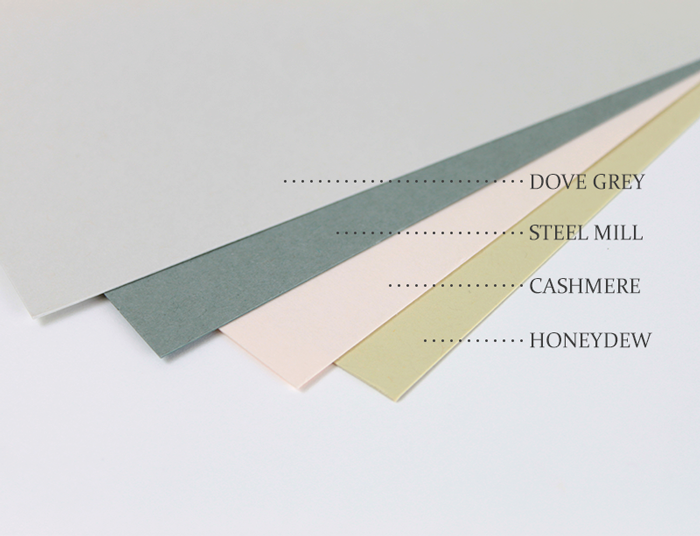 With that in mind, we are releasing 4 new neutral card stock colors this month that I'm sure you will love. Don't forget, we will be sharing lots of inspiration featuring these new sets, plus many of our older sets all month long. We're also hosting several challenges and giving away prizes! 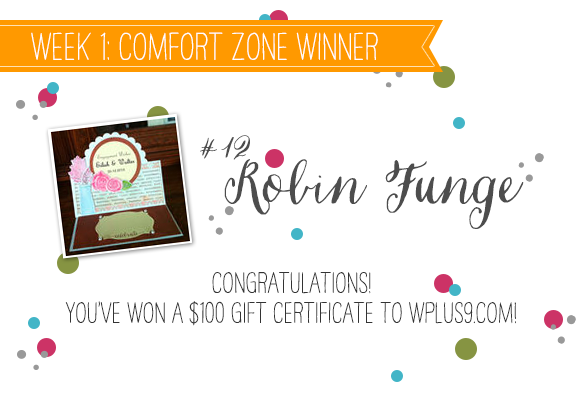 Check out the Comfort Zone Challenge and enter to win the first of four $100 Wplus9 Gift Certificates!